I know some of you are asking why are we readopting. We are readopting for two reasons: one so Aaron has a Pennsylvania birth certificate which will make our life and his easier. We don't have to use his Guatemalan documents. Second it allows us to his official name change easier simpler because it is just part of the process. So December 11th we went to the courthouse and completed our readoption. 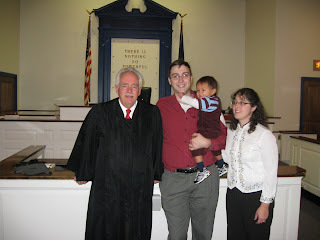 The picture is of us and the judge.